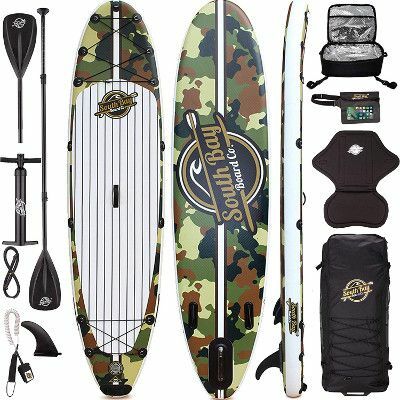 Inflatable standup paddle boards are the literal meaning of the famous expression “make your life easier.” And they did; with these iSUPs, you can go paddling, fishing, surfing or touring anytime and anywhere you want as you can also take anything you need with you because you’ll have space on board to secure it. 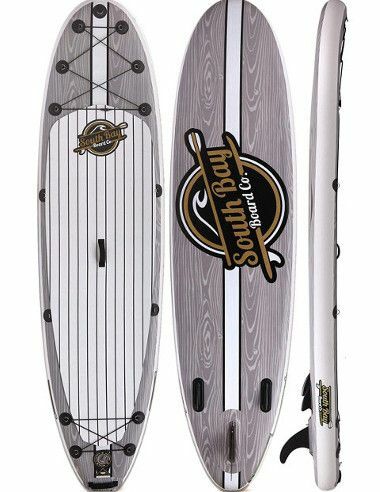 I’m not trying to make hard boards seem unpractical because the South Bay Board Co is one of the companies that love what they’re doing, and with a line that makes both hard and inflatable boards, they are providing their customers with an iSUP that is highly similar to their authentic ones in terms of looks and performance which is basically every other brand’s goal. The Aqua Discover 10’6″ is our guy for this review; so let’s get to know more about it. Aqua Discover measures a solid 10.6 feet in length which I’d call the perfect dimension for all different activities and riders. It’s a known fact that the longer the iSUP the faster it’ll be; though there are other factors that contribute to speed… Personally speaking, I’m not into racing or great speed, thus, an iSUP around 10 or 11 feet long is great for me. And with such a great design as the one given to the Aqua Discover, I wouldn’t bother look for something else. Talking wideness, Aqua Discover is 31 inches wide which will always remain the best you can get because there are very few iSUPs that would exceed this number. 31 inches is great for comfortably standing on the board in complete balance. You’ll also be able to lie down or sit in complete safety and sturdiness. Moreover, the 6 inches put into thickness add to the board’s performance greatly; the board won’t be easily submerged in water even when it reaches maximum weight capacity (350 LBS). Not only that; thickness always adds to the stiffness and hardness of the board, thus, the Aqua Discover is a great deal when it comes down to measurements. 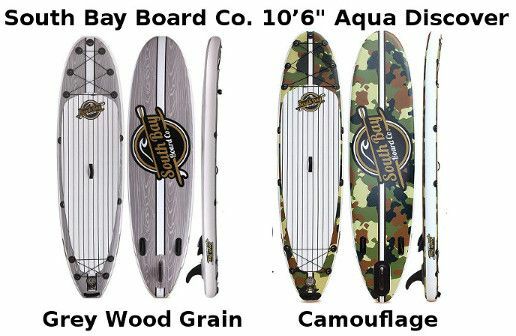 P.S : The South Bay Board Co. Aqua Discover comes in Two colors : Grey Wood Grain and Camouflage. The South Bay Board Co follows a simple policy that emphasizes quality and good customer service, that’s why you’re highly to find all SBBC’s clients pretty pleased and satisfied. The Aqua Discover is a light weight inflatable standup paddle board that can easily be packed and transported anywhere, but it’s also up to the great challenge of maintaining its shape and performance against natural or human effects. This board is made of top quality military grade PVC and drop stitch material that are universally known for their ability to stretch up to 15 PSI making the board nearly as hard as an authentic one. Add to that the high end design which the least I can say about is that’s it’s amazingly made. It’s very well thought of before making it happen; the moment you lay an eye on the Aqua Discover you come to believe that it’s a hard surfing board, and you might stop believing so only if you came closer and noticed the valve. Furthermore, the wood grain design on top and bottom is so beautiful, classy and appealing, making the Aqua Discover a strong, attractive and durable iSUP. Inflatable stand up paddle boards are special because of these features that we’re going to talk about in a bit. It’s what makes stand up paddle boarding a friendly water sport that nobody is afraid of trying. The Aqua Discover is optimized with functional and handy features for a great paddling experience. You’ll find an EVA traction pad that covers more than 2 thirds of the boards back, making it so easy to stand comfortably anywhere on the board. It also adds to the board’s thickness making it stiffer and denser. The Aqua Discover has something different than most iSUPs and that’s 2 storage areas; one on the nose and the other on the tail. In other words, this board is featured with 10 D-rings; 6 of which are connected with a bungee cord on the front, and so are the remaining 4 on the tail. In addition to that, you’ll find another 2 D-rings; one is on the nose for toeing, and the other is on the tail’s end for safety leash attachment. It’s a perfect complete bungee system that’ll allow you to secure anything at all to the board once in the water. Next, we’ll talk about the navigation system which consists of 3 fins; one of which is large, central and removable, while the other 2 are smaller and fixed. These fins are essential for water tracking especially in flat water. 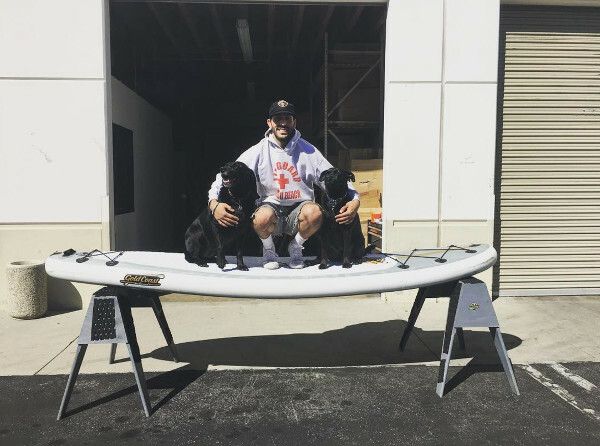 Another feature that helps make iSUPs highly practical is the carry handles; they’ll allow you to easily carry the inflated board anywhere you need as there are 2 of them, a central one and another on the board’s tail. The last feature I’d like to add is the design and color choice. As previously mentioned, this board is made to simulate an authentic one. I find it really attractive and appealing thanks to the wood grain print. With its rounded nose, the Aqua Discover glides smoothly in flat water. Getting yourself balanced on top of it is not a hard thing to do thanks to its wideness and the strong grip traction pad. The fins make tracking so much better as you cut through the water, and it’s so easy to control the board and guide it using you body weight and the paddle. 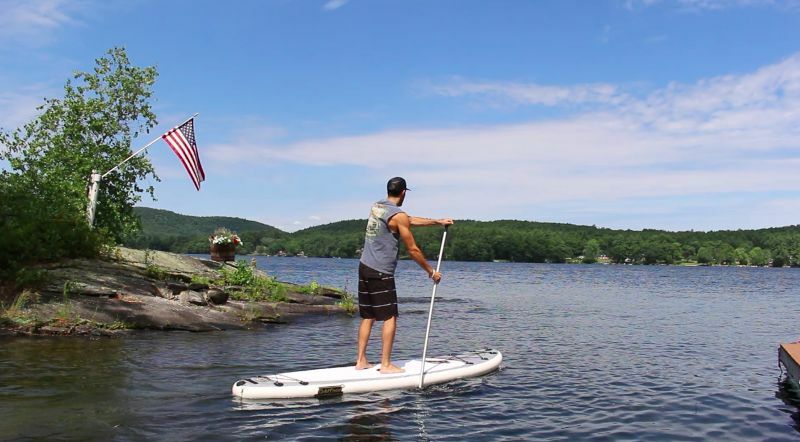 The Aqua Discover is quite responsive to maneuvers and quick turns which will keep you away from feeling bored or frustrated with paddle boarding. All in all, I’d blindly recommend this board for anyone who is looking for a stable, durable, well-built and smooth iSUP. I’d personally name it as one of my favorites. The Aqua Discover comes in a great complete package. The board is featured with two storage areas (front and back). The traction pad covers most of the board’s back. The color choice, design and built are so amazing they simulate an authentic had board. It comes in Two colors : Camou & Grey Wood. Nothing seems wrong with this board, but an update would follow if anything changed.